Bristol is to get a new fleet of low emission buses in a government drive to cut pollution. South Gloucestershire Council will be awarded £4.8m to spend on 110 gas buses for services around Bristol. Go South Coast with Wiltshire County Council will also receive £500,000 for three electric buses to be used on park-and-ride services in Salisbury. Transport minister Paul Maynard said the move would improve air quality across the UK. 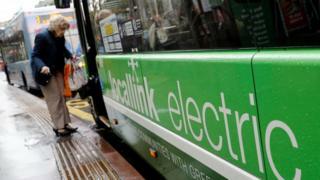 The firms are among successful bidders for £11m of available funding for low-emission buses in England and Wales. A total fleet of 153 electric and gas-powered vehicles will be delivered for services in Bristol, York, Brighton, Surrey, Denbighshire and Wiltshire, as well as the stations to fuel or charge them. It is part of a £900m programme aimed at propelling the UK to the top of the market for greener cars, vans and buses. Mr Maynard said: "Low emission buses are an important part of our plans to make motoring cleaner and improve air quality across the country. "New greener buses will be more comfortable for passengers, they are cost efficient and are good for the environment. "I am pleased to announce this latest group of successful bidders, which should make a real difference to air quality in towns and cities across the country." Denbighshire County Council will receive £500,000 for four electric buses, Surrey County Council will get £1.5m for nine electric buses to be used on park and ride services in Guildford and The Big Lemon will get £500,000 for three electric buses to be used in the Brighton area.